There’s nothing more American than taking part in holidays that celebrate our country’s diversity, from Chinese New Year to Saint Patrick’s Day—especially when those holidays are a perfect opportunity to indulge in certain foods. The cliché (based in truth) is that the potato is king in Ireland. And lucky for Bay Area fish markets, this island nation is also famous for a variety of seafood. Take advantage of this tasty pairing of fish and potatoes and whip up something special for your customers to take home this Saint Patty’s Day: Irish Boxty. 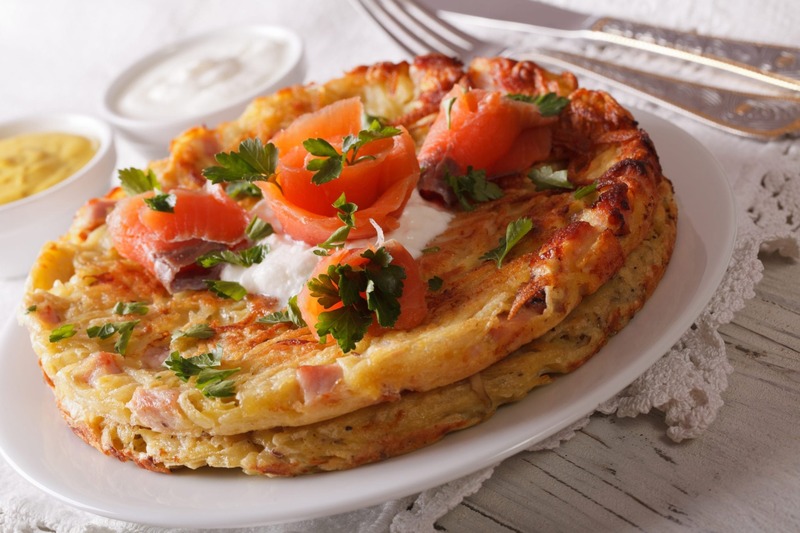 Boxty are traditional Irish potato pancakes. Because they use a mixture of mashed and grated potato they have a unique texture—part cake, part hash brown. While most recipes rely just on potato, our favorite secret ingredient is smoked trout or smoked salmon. However, boxty compliments just about any fresh fish, so if you decide to make the pancakes without trout or salmon, simply pair the patties with a seafood special of the week, ordered from Pucci Foods. If potatoes aren’t up your alley, here’s another idea. While bars will be serving up green beer in honor of the holiday, your fish market could capitalize on Ireland’s most popular beer: Guinness. The rich, dark, dry stout makes a fantastic beer batter for fresh fish. After the recipe for Irish Boxty with Smoked Fish, you’ll find a super simple recipe for Guinness Beer Battered Cod. Last but not least, make sure to draw attention to any Saint Patrick’s Day specials with decorations or signs. A sense of humor never hurts in this department. A leprechaun holding a Guinness in one hand and a basket of fish in the other? Why not. A pot of golden potato pancakes at the end of a rainbow? It’s sure to bring a smile, if not a purchase. In large mixing bowl, mash together cooked potatoes and buttermilk. Add flour, baking soda, salt and pepper. Mash together. Stir in raw potato, smoked fish and dill until well combined. Heat butter in a large pan over medium heat. Using ice cream scoop, carefully drop boxty batter into pan and brown on both sides. Garnish with fresh dill and serve with sour cream. Pour the Guinness into a large bowl and add the flour, baking powder, salt and pepper. Whisk until it is light and frothy. Let the batter sit for 15 minutes. Meanwhile, heat a deep fryer to 180°C. When the batter is ready, dust the fish with flour and coat evenly with batter. Fry for 5 – 6 minutes, turning once halfway. Tip: to keep your batter from sticking to the wire mesh of your fryer, take the mesh out and use a slotted spoon to lift your fish instead.